Friday Wrap-Up – News from TrailWay, Sea Level, Tatamagouche, Tidehouse, Gahan Halifax and Charlottetown, and more! Welcome to the last Friday Wrap-Up of January. Plenty of new beers to tell you about, and a slew of events coming up too. Let’s get right to it! • The judging the first annual TrailWay Homebrew Competition took place last weekend; close to 30 entries in the American IPA category were evaluated by six judges (including our very own acbbshawn). The winner and runner-up will be announced on Sunday, but in the meantime, TW’s newest DIPA, Hop Stains, will be released at the brewery today at 4 pm. Hopped heavily with Azacca, Citra, and El Dorado (with the emphasis, of course, on whirlpool and dry hop additions), expect a smooth IPA with a creamy mouthfeel, with lots of fruit throughout, and a bit of bubblegum. Not too bitter at ~60 IBUs, it clocks in at 8% ABV. A limited number of cans (40 cases) will be available, with the rest going into kegs for lucky tap accounts. • There’s a brand new beer available now from Port Williams’ Sea Level Brewing – Callahan’s Crosstime Irish Ale. The brewery is calling it a “malt-forward, smooth Irish Ale”, but it takes a different direction than the norm, thanks to the addition of Galaxy hops (to 30 IBUs), giving a “sublime, tropical fruit aroma”. Horton Ridge Pale Malt is included in the grist, with the beer coming in higher than your typical Irish Ale, at 7.3% ABV. Available in cans, 1-L growlers, and on tap at select accounts across the province. • After a tease last Saturday at Ducky’s, Tatamagouche Brewing has released the latest addition to their Giant Beer series. Barrel Aged Barley Wine features a recipe variation from last year’s Giantess Barley Wine, as it now uses Horton Ridge malt as the majority of the grist. According to Brewmaster Matt Kenny, “This change adds some spice and a little more body, which we felt worked well with the spirit and barrel character”. Speaking of which, the beer was aged in freshly-emptied Single Malt barrels from Cape Breton’s Glenora Distillery, picking up plenty of complexity during the process. The 10.5% ABV beer is well-balanced and ready to drink now, or will age gracefully for a new experience. Available exclusively in bottles at their Main Street Tatamagouche location, drop by today to grab a couple (one to enjoy now, and another to enjoy in a few months or a year, if you can keep it that long!). And while you’re there, you’ll be able to spy the expansion underway, as Kenny and Co look to double their fermentation and conditioning capacity to keep up with demand, and have a more permanent solution for their canning line. The building, and resultant improvements, will be online to help with the upcoming summer rush. • Gahan Harbourfront in Halifax saw two beers hit the taps this week. Monday was the release of a new beer, the English Golden Ale that features ingredients sourced entirely from the UK. Technically a SMaSH (but not simply for the sake of being a SMaSH), the eminently British Maris Otter is the lone malt, providing a doughy character with honey overtones, while the hops are all Fuggles, a classic for British styles, bringing herbal and floral notes. At only 16 IBU and a fairly light 4.5% this should be an extremely easy-drinking ale with a fairly full flavour profile that belies its weight. • And on Wednesday, the latest variation of the Crosscurrent American Pale Ale debuted, this time venturing afield of the all-American hop varieties featured to this point. Using Magnum (largely for bittering, we presume) and “a lot of” Dr. Rudi, a New World variety from New Zealand known for bringing a refreshing combination of pine, dry lime and lemon aromas and flavours. Still clocking in at 5.5% ABV and still featuring a malt bill of primarily pale malt with some flaked oats and flaked wheat, the IBUs are a tad lighter on this batch at 32, but we suspect the hops are much more evident in flavor than in bitterness. Both the English Golden Ale and the new Crosscurrent are available for pints and growler fills. And be sure to sign up for their Home Brewer’s Challenge before the Feb 17 deadline by email; they are looking for your best Trappist Single. Check our previous post for more details. • Sticking with Gahan (and Homebrewing), but skipping across the Northumberland Strait, Charlottetown’s Gahan Pub has released the winner of the PEI installment of the Home Brewer’s Challenge, Green Willy Solstice, a 7.9% ABV Winter Warmer. The winning team of Jonathan Green, Clayton Harding, Will Panting, and Jaime Venturini joined Brewmaster Trent Haynes for the day, using molasses and a blend of spices for a warming profile to the beer. Grab a pint on tap at Sydney Street now. • Smiths Cove’s Lazy Bear Brewing is releasing a special beer next week, featuring a unique local ingredient. Bunchberry Orange Kolsch is a 4.5% ABV German hybrid beer (hybrid of ale and lager yeast, more temperature-tolerant), with oranges grown in Nova Scotia. Bunchberry Nurseries were the folks who grew the Poncirus trifoliata, also known as Japanese or Chinese Bitter Orange, a cold-tolerant citrus tree. To celebrate this first for the province, Lazy Bear are holding a public tasting of the beer at Bunchberry in Upper Clements, February 3, 7:00-9:00 pm. To honour the unexpected combination, there will be a beach theme to the evening, and it will feature local food. The beer is in very short supply, so be sure to drop by that evening to avoid disappointment. If there does happen to be any left, it will be available at the Annapolis Royal Farmers’ Market the next morning. • Ontario’s Beau’s Brewing is brewing a series of collaboration beers in 2017, to celebrate the 150th birthday of our country. Their first in this series was conceived with the Fogo Island Inn, located on Newfoundland’s Fogo Island. Described by the brewery as a “Myrrh-Smoked Gose”, this one is definitely different! Along with Pilsner, Acid, and Carafoam malt in the grist, Wheat malt that was smoked with myrrh collected from the Island’s pine, spruce, and fir trees was added. The saltiness typical to the Gose style was obtained by the addition of island-foraged sea salt, and Newfoundland partridgeberries were added for tartness (as opposed to the usual practice of introducing Lactobacillus bacteria). This is a higher-ABV than usual for a Gose, at 6.7% ABV; it was hopped with Strisselspalt and Simcoe to 35 IBUs, also high for the style. Beau’s describes the beer as hazy orange, with earthy and woody aromas mingled with mild fruitiness, and smoky and tart flavours. Named 49° 54°, it’s going to be available only at the Inn, with $1500 in sales being donated to the Shorefast Foundation. For more info on this beer, check out Beau’s full description. And be sure to follow along with Beau’s future collaborations, as some more Atlantic Canadian terroir beers are sure to pop up! • In case you missed yesterday’s post, Halifax’s 2 Crows Brewing will be opening their doors at 1932 Brunswick Street tomorrow, from noon. Check out the full details in the Profile, but be sure to drop by for the special tap room-only Bakeapple Sour, Aztec Milk Stout, and Mango & Brett IPA, as they will be sure to sell out quickly (and are not available elsewhere). • After (or before) a stop for that pint and growler fill tomorrow, drop down to Bishop’s Cellar for a co-tap takeover of their growler filling station with Dartmouth’s Brightwood Brewery and Sheet Harbour’s Sober Island Brewing. The crews from both spots will be on hand from 1:00-3:00pm to chat and pour samples, before you dive in for a growler filling. • And while you’re in the downtown core tomorrow, be sure to drop by Stillwell Beer Bar on Barrington for pours of three special beers from Toronto brewery Bellwoods. The Plum variant of their Jelly King, a dry-hopped Lacto sour; Jutsu, a Vermont-inspired 5.6% ABV Pale Ale; and Farmhouse Saison, fermented with Brettanomyces Lambicus. These will be on from noon, when you can also take advantage of their “Bottle of the Day”, where they are offering up a bottle from their cellar for pours from the glass, rather than having to spring for the whole shebang. • Tide & Boar Brewing is holding another of their Beer to Go days tomorrow, January 28th, from 10 am-6 pm. Two beers will be available for growler fills: Killington IPA, a 7.6% ABV Northeast IPA featuring plenty of Citra and Mosaic hops, and a new take on their Sour Otis Grapefruit, which has been rebuilt from the ground up, according to brewer Chad Steeves. Twenty-four grapefruits per barrel were added to the beer, making it more acidic than ever. Only a limited supply of these beers (2 kegs each) will be available, so get over early! • New Brunswick Beer Tours is holding their FROSTival Brewery Tour next Saturday, February 4th, and there’s still a few tickets left! They’ll be following their usual itinerary of four brewery stops (this time around, Graystone, Maybee, Mama’s, and TrailWay), before a final stop at the King Street Ale House for a pint with Off Grid Ales‘ Randy Rowe; each brewery stop includes four sample pours. Tickets are $68.50 each, and include – of course – transportation between all stops. • Sick of winter yet? If you’re in the Fredericton area, Maybee Brewing is offering a cure – of sorts – with their Beat the Winter Blues, scheduled for next Saturday, February 4th. A night of live music and beer (from 7 pm-1 am), your $12 advance ticket ($20 at the door) gets you admission to two live bands, The Tortoise The Hare & The Millionaire, and Keith Hallett. Of course, there will be plenty of Maybee beer on tap, as well as a guest brewery or two, for purchase. A food truck will be on site, and a free shuttle to downtown will be available between 12-1:30 am. • After a wildly successful debut at TrailWay, the Fredericton Ladies Beer Connection have got their next event scheduled at Maybee Brewing February 8th at 6:30pm. $14 will get you a flight of beer, tour of the brewery, and insightful chat with fellow beer lovers (and those looking to learn more). Check out the FB Event page, and be sure to RSVP in advance. • This year’s Péché Day – a celebration of one of Canada’s highest-rated beers, Dieu du Ciel!‘s Péché Mortel – is scheduled for Saturday, March 11th. Luckily for all of us, this year three Maritime bars have been selected to participate! What does this mean? It means that these three locations – the King Street Ale House, Stillwell, and Tide & Boar – will have six different variants of the coffee-infused Imperial Stout on tap for you to enjoy (check out the event poster for a list of all expected). It’ll simply be pay-as-you-go, but be warned, this is a big beer! • Speaking of March 11th, the 5th Annual Fredericton Craft Beer Festival is fast approaching! While the evening session did sell out quickly, there are still afternoon tickets available, which offers the option of a slightly-more-relaxed experience… and the option of continuing afterwards with Péché Day at the KSAH! If you’re an alumni (have attended the last four festivals) and haven’t yet picked up your tickets, be sure to do so with the special alumni code emailed to you by FCBF organizers – aside from all the great local craft beer, you also get a T-shirt, custom glassware, and more! – The crew from Bishop’s Cellar drove up to Nyanza this week to brew up a collaboration at Big Spruce Brewing. Coming next month will be Anaphylactic Choc, a peanut butter and chocolate porter, featuring organic peanut butter added right to the boil, for a blast of nutty goodness. We’ll share more details when the beer is released on February 25th, at a Takeover of Bishop’s growler filling taps. – Breton Brewing has brought back Crazy Angus Double IPA, the amped up brother to their Black Angus IPA. At 7.4% ABV and 85 IBU, it’s sure to cure that hop itch many of us have! Grab it on tap at their taproom, and accounts around the province. – Gahan Halifax will be hosting their first Brewmaster’s Dinner on February 21st, featuring four courses from the chef specifically paired with beers from Kyle Jeppesen’s brewhouse. More details are in the offing and we’ll bring them to you as they become available. – Garrison Brewing is holding a contest on Instagram, celebrating their Dirty Ol’ Town Black IPA. Take a picture of why you love the town, and tag @garrisonbrewing and use the #LoveThisDirtyOlTown hashtag. They will regram all entries, and the one with the most likes by February 9th will win a brewery tour for 10 people. It’s been half a year or more since the first reports of 2 Crows Brewing made the rounds, and excitement has been building steadily ever since. This Saturday, January 28th, at noon, the doors will finally open at 1932 Brunswick Street and everyone will be able to see what the anticipation has been about. Named for a fascination with an old rhyme about crows that begins, “One for sorrow, two for joy,” the spirit of 2 Crows is all about seeing one crow and immediately looking for another, that is, seeking out joy even when faced with sorrow and trying to find the brighter side. 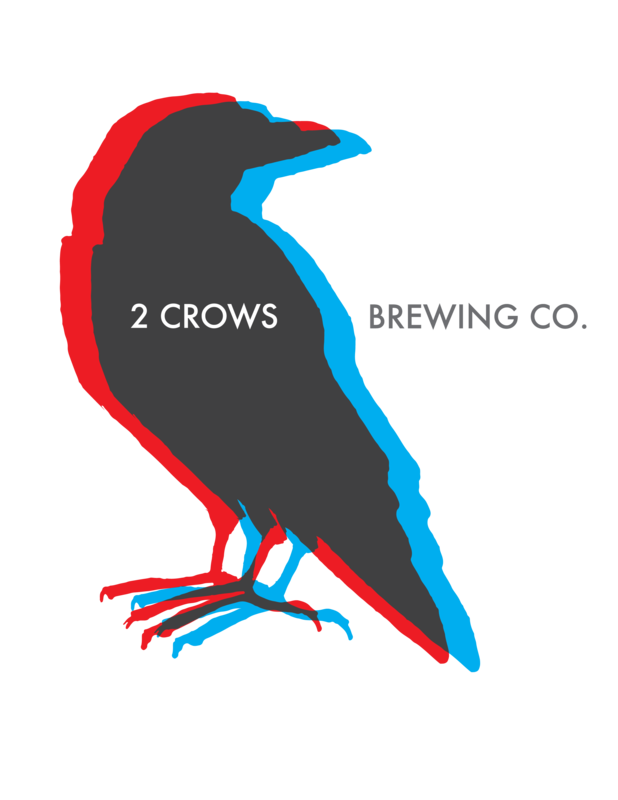 2 Crows brings the husband and wife team of Mark and Kelly Huizink together with brewer Jeremy Taylor in a venture that will bring some unique brews to our scene right out of the gate. Originally from Vancouver, Jeremy and his wife Elaine, who is from Dartmouth, have been looking to come East for some time. Jeremy most recently spent a few years as head brewer at Bridge Brewing in North Vancouver after some time in Scotland where he acquired his formal brewing education and took his first brewhouse job. After a childhood of travelling from country to country, Mark landed in Halifax for University in the early 2000s where he met Kelly, who is from the area, and they’ve been based here ever since. Mark is half Belgian and half Dutch, and his trips with Kelly to visit family over the years introduced them to many varied styles of beer and gave them an appreciation for the industry on an international scale. Watching the beer trends change at home, with friends becoming more interested in different styles of beer, seeing the local industry grow by leaps and bounds and having always loved the idea of opening a business locally, they decided to take the plunge. Mark leaves behind a 7-year career in accounting to work the business side of the enterprise, while Kelly will run the taproom. Jeremy and Mark were kind enough to answer our many questions about how the brewery came about, what beers they’ll be introducing on Saturday, and what they’ve got planned for the future. Jeremy: I am from Vancouver originally. My wife is from Dartmouth, and we have been aiming to move back here for a number of years… I have wanted to be here because of how exciting the NS beer scene is, and how awesome people from NS are. Outside of beer, I do a fair bit of camping, hiking, and fly fishing with my dog and wife. I used to play a lot of rugby when I was younger, and first came to NS in the early 2000s because I played for the Newfoundland provincial team. Mark and Kelly Huizink are the other part of the brewery. Mark is 1/2 Belgian and 1/2 Dutch, and grew up bouncing around from country to country because of his father’s work. Mark landed in Halifax around 15 years ago for university, and has loved life here ever since. He met Kelly while in university, they have been together ever since. Kelly, having been born and raised here in Halifax, was always excited about the idea of opening up a business locally. They have two kids, both born here in Halifax, and are excited about the idea of raising their kids in such a wonderful place. Being part of the burgeoning craft beer industry here in a place that they love so much has been a dream for both of them, and it’s now starting to look like a reality. How did you get into the world of beer? Jeremy: I started off by homebrewing. I was working as a researcher in a biochemistry lab, doing some really neat genetic sequencing work… but it wasn’t what I wanted to be doing for the rest of my life. My wife got me a very simple homebrew kit, and I was sold — it had the perfect combination of geeking out on science, playing with flavours (I’ve always enjoyed cooking and baking), plus there’s a beer at the end of the process. I decided to give up the scientist job and go back to school for brewing. I did an MSc in Brewing & Distilling at Edinburgh’s Heriot Watt University, worked a little bit helping set up a barrel-ageing program at a Scottish Brewery, then worked in Vancouver as a head brewer for a couple years before ending up in Halifax. For Kelly and Mark, drinking craft beer started on their many trips to Europe visiting Mark’s family. These travels have opened their eyes to the many different styles of beer available in Europe and the rest of the world. Watching the demand for variety and quality in beer develop over the last few years has made them all the more excited to be living in Nova Scotia and have more and more of their friends get into the appreciation of good beer being produced locally. Their excitement for beer is more on the “consumption” side of things, but with this business we are all hoping to push the envelope and make some exciting new styles of beer. What made you decide to take the step into opening a brewery? Jeremy: Since I started getting into brewing, the goal has been to move to Halifax and open a brewery. It is great to have any sort of brewing work, but the idea of being able to call the shots and brew what you love is really the dream. Nova Scotia has such a cool brewing scene that I feel is still just starting to get rolling, and the hope is that we can be part of this wave of high-quality craft beer and keep pushing the levels of quality and craftsmanship. Mark, being an accountant and a beer lover, put together a business plan for a brewery here in Halifax. We were put in touch with each other by a mutual friend, who is also a brewer, and we came to the conclusion that we had very similar ideas of what a successful brewery should look like and that between us we had the skills and resources needed to make it happen. Fast-forward a year and here we are, opening up a brewery and living our dream. Can you share some info on your homebrewing history? Jeremy: I think the first brew I ever did was an all-extract kit from Dan’s Homebrewing in Vancouver. After that, I wanted more control over the brew, so I stepped up to doing partial extract, and it all went from there. I stuck to mostly English and North American styles at first, but got a little bit more adventurous as time went on. I haven’t had a chance to homebrew for probably about a year now, but some of my last batches were a lambic-style with aged hops, a no-boil Berliner Weisse with wild lacto and wine yeast, and a Brett IPA. What system will you be brewing on? What sort of output do you expect? 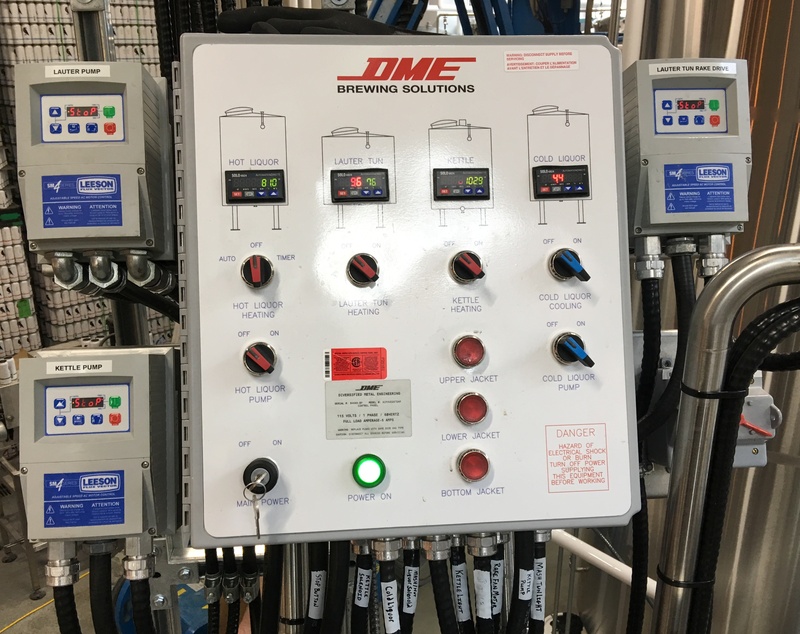 Jeremy: We are brewing on a 24hl (20bbl) DME brewhouse, and brewing into 48hl (40bbl) unitanks. The brewhouse is a 2 vessel system — a combined mash/lauter tun, and a combined kettle/whirlpool. We will be canning using a Cask canning unit, their 5 head automated filler that is capable of roughly 36 cans/minute. Monthly output will depend on demand. We have oversized our system a little bit, as we heard about a lot of breweries locally that were basically maxed out and looking to expand within a week of opening their doors. If we ever get to max capacity on this system, we would be producing about 310hl (264bbl) per month. Jeremy: We plan on kegging and canning our beer right out of the gate, and we will also be offering growler fills in our tap room. The hope is that we will have our canned beer, and possibly kegs for growler fills, at a few of the private stores — we have been chatting with the folks at Bishop’s Cellar and RockHead, who have both been very supportive. We are also trying to get our canned beer into the NSLC eventually too. We are also aiming to be on tap at bars/restaurants around the city. Can you tell us about your taproom? Jeremy: We hope the taproom is going to be a pretty cool experience for people. We wanted customers to feel like they were coming for a drink in a working brewery, so it has been designed to be very open. People will be able to see the brewing process, and chat with me (or just shout profanities at me) as I brew. We will have 12 taps on the go; one of which will be a cider, and the rest will be a combination of our beers and a few guest taps. 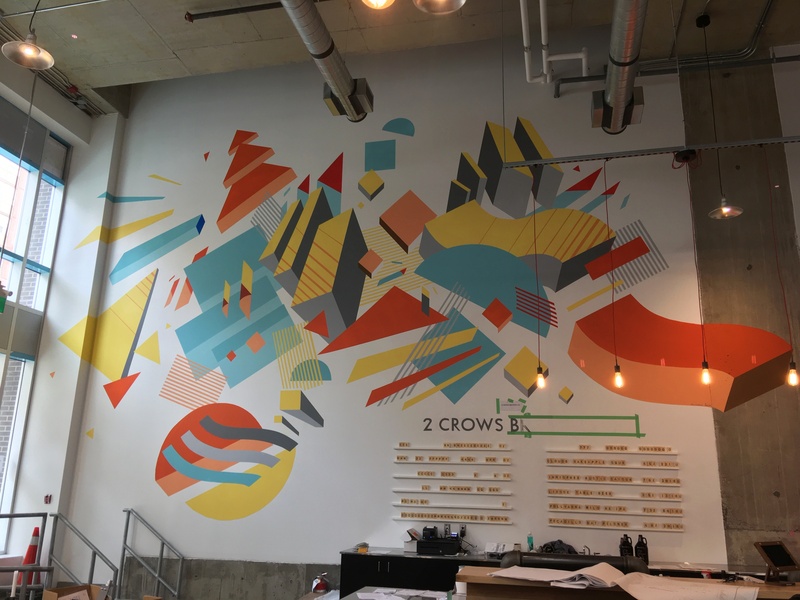 We have had a local artist, Christian Toth, do up a really impressive mural on the main wall in the tap room, which we think looks pretty cool. People will be able to drink full pints and have tasting flights there. We will be offering a pretty limited, but well-curated selection of food — charcuterie and cheese from Ratinaud — but we also encourage people to bring or order food from elsewhere while they are visiting. Can you tell us about the beers you’ll be offering initially? Jeremy: Our core lineup will consist of three beers: Pecadillo, an Oat Pilsner, 4.8% and 28 IBU; Liesse, a Table Beer, 3.5% and 16 IBU; and Pollyanna, a Wild Northeast IPA, 7.3% and 64 IBU. We will also hope to be brewing lots of seasonals and on-offs, the first of which will be Innisfree, a 7.6% ABV Rustic Saison brewed with spelt, and fermented with yeast we harvested and built up from a bottle from Belgium. Plus a few more tap-room-only releases that you’ll have to drop by Saturday to try! Have you had any assistance from other breweries/people in the province? Jeremy: Everyone we have met from the NS brewing scene has been awesome! We have had advice from basically everyone we encountered — many of whom have gone out of their way to track us down or come visit in order to let us know how best to navigate the trials and tribulations of starting a brewery. Nash invited us by Unfiltered a few months back when he heard we were about to install our glycol system, so he could show us what did *(and didn’t) work on his setup, and how to avoid headaches. Daniel at Garrison actually helped me out of a bind with hops that came as a result of miscommunication with our hop supplier. Jeff from Bad Apple came by (bearing gifts of beer) just last week when he heard we were having some trouble with some controllers, to help troubleshoot. Shean and Peter at Tidehouse have been awesome too, offering to help in any way possible, and we have had visits from Big Spruce, Granite, Schoolhouse, Spindrift, Tata…. the list goes on. Basically, everyone in NS has been incredible and really supportive. Where do you hope to see your brewery in the next 2-3 years? Jeremy: From a beer standpoint, I am hoping we will have a decent wood ageing and sour program by then, along with a nice selection of seasonal beers. I am hoping we can build a reputation both locally and beyond for brewing modern and complex beers. I would love to see us distributing beer a little further than Nova Scotia, if our production level allows it. Obviously, NS is first priority for us, but I have a few good friends across the country that would love it if they didn’t have to come visit in order to get the beer. I would also like to be seen as good brewery people, friendly and helpful to other breweries and other businesses. I would love to work alongside lots of brewers from around the province, and I also have plans for collaborating with brewers from different parts of the world. Do you have a favorite beer style, beer, or brewery you enjoy drinking? Jeremy: I have been spoiled since moving here because of all the Belgian beer that Mark’s family has been bringing. Obviously, I am a sucker for anything from Cantillon. I also love North American sours a lot too — I recently had a Reynard Oud Bruin by Iain Hill at Strange Fellows brewing that was sublime. The guys at Four Winds in BC also make some exceptional sour and clean beers. I love the juicy/hazy Northeast IPAs too, the stuff by Bissell Brothers is incredible, and I had the good fortune of getting a bunch of Alchemist beers a few months ago too, which was really a treat. I also visited Hill Farmstead… if I could drink nothing but beer from them for the rest of my days, I’d probably be OK with that. How about favourite style or ingredient to brew with? Jeremy: I love Thomas Fawcett Oat Malt — I feel like it gives a really nice texture, more so than flaked oats do. I tend to sneak it into a lot of the beers I do. There was a recent article by Scott Janish that has done nothing to quell that, basically saying that oats in beer can lead to a lot of improvements. For hops, I really enjoy hops from the Southern Hemisphere, although they can be a challenge to acquire. My favourite is Nelson Sauvin, but I’d probably have to sell my soul a few times over to get it in any sort of decent quantity/price. For styles… that’s a good one. I really enjoy wood ageing and sour beers, probably more into brewing American sours than traditional European sours. They can be very challenging and a little unpredictable, but I think that’s part of why I am so fascinated by it. Thanks very much to Jeremy, Mark, and Kelly for spending some time with us. Drop by the brewery tap room from noon on Saturday, Jan 28th, and daily going forward noon to eight (noon to ten Thurs-Sat). 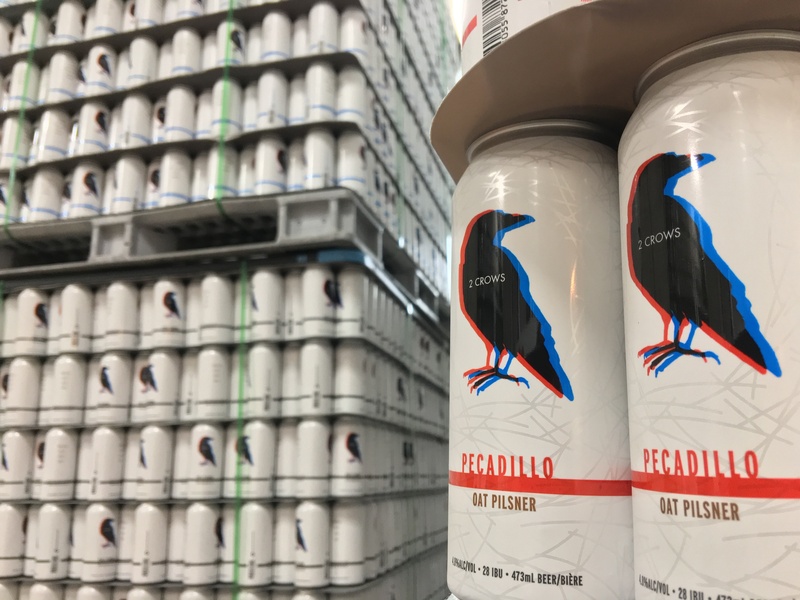 Drop by to purchase cans of their Pecadillo Oat Pilsner, Liesse Table Beer, and Pollyanna Wild Northeast IPA to go; growlers of those three, plus the Innisfree Rustic Spelt Saison will be available as well. Those who pull up a stool (or rocking chair) will also have their pick of some draught-only small batch brews from their pilot system, including a Bakeapple Sour, Aztec Milk Stout, and a Mango & Brett IPA. Keep your eyes peeled on their social media accounts for more details: Facebook, Twitter, and Instagram. Friday Wrap-Up – News and Brews from Think, Flying Boats, Loyalist City, YellowBelly, Bore City, Graystone, and much more! We’re firmly into 2017 and we’ll all hopefully be able to stop typing 2016 any day now. Though the we haven’t quite reached the dead of winter, the beer scene in the region is still showing plenty of signs of life and it’s not looking like that will slow down any time soon. Read on for all the news on new beers, re-releases, and beer- and brewery-related events throughout our corner of the country. And don’t forget, the first kegs from Harvey, NB’s Think Brewing will be available this weekend. We have confirmation that they will be on tap at the James Joyce Pub and 540 Kitchen in the next day or two. To learn more, check out Tuesday’s Profile with Think. And now on to the rest of the beer news! • A little over a year ago, Flying Boats released Double Oatmeal Stout, an easy-drinking beer with plenty of oatmeal and roast character. Recently, owner/brewer Marc Melanson has changed the recipe, with the result being Station Master Stout. Over 10% of rolled oats, along with specialty malts including Chocolate and Roasted varieties, makes up the grist, giving “slight chocolate, coffee, and roastiness” in the flavour, along with a full-bodied mouthfeel. Hopped with East Kent Goldings to 28 IBUs, expect this one to weigh in at approximately 5.2% ABV; look for it at Flying Boats tap accounts sometime within the next couple of weeks. • Saint John’s newest brewery, Loyalist City, released another of their flagship beers for the first time late last week. An American Pale Ale, Three Sisters Pale Ale (6% ABV, 60 IBUs) features a blend of three popular American hop varieties – Centennial, Citra and Mosaic – to give “an assertive mix of citrus and tropical fruit flavor and aroma”. The high majority of the hops were added in the whirlpool, after the boil was complete, to maximize the deliciousness of these varieties, without adding too much bitterness in the finish. The grist was kept simple, with a mix of two base malts, to complement the hops but not overpower them. Fermented clean with an American Ale yeast strain, more Mosaic was included in not one, but two, dry-hop additions, resulting in even more tropical fruit in the aroma. For historians, the beer was named after the Three Sisters Lamp, which was erected in 1842 at the end of Prince William Street “to welcome visitors to the Saint John Harbour by guiding them safely into port”. Look for Three Sisters on tap at select accounts in the city, including Cask & Kettle and Five & Dime, and at the ANBL Growler program starting Jan 26 at the three SJ-region locations. Details are thin, but look for LCBC’s Extra Special Bitter to hit the taps this weekend, we’ll share more details when we have them. • YellowBelly Brewpub in downtown St John’s has released a new cider this week, featuring partridge berries. Twenty kilograms of the extremely ripe fruit were used for a subtle sweetness and tannic tartness. From Brewmaster Liam McKenna, “It’s like our regular cider with a bit of pink lemonade and the merest hint of wintergreen, methinks.” Grab a pint at the pub, and look for bottles at a few St. John’s NLCs next week. • Fans of Moncton’s Bore City Brewing can look forward to their first new beer release in a while, a currently-unnamed “lower-ABV Belgian style Ale” (think roughly along the lines of an Abbey Single or Table Beer). With a grist of mainly Pilsner malt and Munich II, it was hopped with East Kent Goldings and Hallertau Blanc, and fermented with a Belgian yeast strain, White Labs’ Belgian Golden Ale. This one should come in around 5.6% ABV; it won’t be ready for another few weeks, according to the brewery, but we’ll have more information to release before then! • Graystone Brewing has their first Lager on tap at their taproom and elsewhere in Fredericton. The North is a Pilsner that was “amply hopped” with two varieties, German Perle and Czech Saaz, giving distinctive floral and spicy notes to the beer. Fermented cool at 13 C with a European Lager yeast, the beer was further lagered at cold temperatures for six weeks. It clocks in at 5.3% ABV and 40 IBUs, and is available now for pints, and crowler/growler fills. • Graystone also released another new beer yesterday, Shiver Stout, to coincide with this year’s Shivering Songs Festival. With an addition of a cold-brewed medium roast blend from Whitney Coffee Company added directly to the beer, there’s plenty of smooth coffee flavour (without any harshness) in this one. On the lighter-ABV end for a stout (4.7%), it clocks in at 30 IBUs; while exploring around Fredericton for the festival, be sure to seek this one out! • Continuing with Fredericton, Bogtrotter has a new beer popping up around the city. Drunken Newt Red Rye Ale was brewed with Rye malt in the grist, with nutmeg added late in the boil. This deep red-coloured beer comes in at 5% ABV, and features “aromas of fresh rye bread, caramel malt and hops”, according to the brewery. Expect flavours of caramel, toffee, and a hint of, naturally, nutmeg. It’s available on tap around Fredericton, and is also in 500 mL bottles at the York St. and Oromocto ANBL locations. • Now firmly in the middle of winter, it’s time for the return of one of last year’s favourites, Big Spruce Brewing‘s Coade Word: Snowmaggedon, an ode to local meteorologist Peter Coade, who retired in September 2016, after a record-breaking 54 year career. This Winter Warmer is 7.4% ABV, and features Gila Squash grown at their brewery farm. It was oven roasted with organic cane sugar before being added to the mash, extracting some extra sweetness and complexity. After primary fermentation, the beer was conditioned with a dark rum tincture of local ginger with organic cinnamon and vanilla. This release is draft/growler only, while the next release will be aged in barrels and will be available on draft, and in bottles. • Mahone Bay’s Saltbox Brewing has released their first Double IPA, Make and Break. Clocking in at 7.5% ABV, the beer features Amarillo and Millennium hops, to the tune of 60 IBUs, balancing the sweet, malty aroma. Grab a pint or growler fill at the brewery, and look for it at their tap accounts shortly. • Be sure to grab today’s episode of the 902 BrewCast, with Kyle, Phil, and Tony tasting through a selection of Nova Scotian and New Brunswick IPAs (including a look at the medal winners of the 2016 ACBAs). They even invited along our very own acbbchris for a nerdier approach to the whole thing. Be sure to share your feedback on their social media feeds, or in a comment below. • Attention large AtlCan breweries! The Canadian Trade Commissioner Service is taking a handful of Canadian breweries on a tour of five US cities next month, and the opportunity to sign-up is now open. Visiting Denver, Minneapolis, Chicago, Atlanta, Miami Feb 27 – Mar 2, brewers will have the chance to meet local vendors, check out the potential markets, and learn about the benefits (and potential) drawbacks to doing business abroad. More details can be found here, including contacts on how to sign up before the application window closes January 25th. • Moncton’s Tide & Boar are holding another Growler Pop-Up today, 10-6pm (or when the beer runs dry). Look for the return of Herbies Oatmeal for Breakfast Stout, Sour Otis Fruit Cake Kettle Sour, as well as two new IPAs: Calling Method IPA (featuring Citra) and Nelson IPA, single-hopped with Nelson Sauvin. The first few folks through the door will receive a free T&B growler (empty) – the early birds get the worm! • A reminder of tomorrow’s Tatamagouche Brewing Tap Takeover at Ducky’s in Sackville. In addition to their core lineup, and special beers that they’ve been saving, it will serve also as the sneak preview of their Barrel-aged Barleywine, being released next Thursday. We’ll have more details on that beer next week. In the meantime, learn more about the evening, and live music, on the FB Event page. • Join Port Rexton Brewing and Quidi Vidi at White Hills Resort in Clarenville, NL next weekend, January 27th and 28th, for Eat the Hill. Pairing their beers with plates from several different chefs, there will be plenty of food, beer, and cheer to go around after a day on the slopes. Tickets are available now. • Mill Street is hosting a Brewmaster’s Dinner at the brewpub on February 8th. Hosted by Joel Manning, Head Brewmaster for the Mill Street family, and Dan Boldrini, Head Brewer at the St. John’s location, it will feature five of beers paired with five courses from the kitchen. The event will take place the evening of Wednesday, February 8; tickets are $60 and are apparently going fast, so if you’re interested, don’t wait. • Halifax’s 2 Crows Brewing will be opening their doors next Saturday, January 28th, for a soft launch of their beers and tap room. Featuring their core line-up on tap, as well as several special tap-room-only beer produced on their pilot system, the fun kicks off at noon. Take a gander at this week’s The Coast newspaper for an article with Kelly, Mark, and Jeremy, and we’ll have a full profile with the crew early next week, to whet your whistle. • Dartmouth’s Battery Park will be holding a Nano Brewery Tap Takeover, featuring four of Nova Scotia’s smallest craft breweries, on Thursday, February 9th. All sixteen taps will be dedicated to beer from Brightwood, Schoolhouse, Sober Island, and Tidehouse. Drop by from 2:00 pm to taste the beers from these small operations, including a few special one-offs casks, and meet the folks behind the beers. • On February 16th, Battery Park is hosting Pop-Up Love Party, an event with live performers expounding on love, paired with local beer and a menu designed by Daniel Burns. It also serves as the launch of just the second beer brewed at North‘s Dartmouth location (in BP’s foyer), Zuppa Symposium. It is a Milk Stout aged on local blackberries and cherry wood, and will be available on tap (both standard and nitro versions), and in bottles. More details are available here, and tickets here. • Like to drink beer and curl? Or even just drink beer and slide around on the ice with a broom? Well, good news! Good Robot is holding their 1st Annual Tournament of Broken Hearts on Saturday, February 18th at the Mayflower Curling Club. Teams of four can sign up here ($80 per team), with all participants receiving GR toques, plenty of GR beer on tap, prizes to the winners, and an after-party. The fun starts at 1 pm and will continue all day and evening. • It’s a ways away on May 27th, but early bird tickets are already on sale for the first annual Yarmouth Craft Beer Festival. Taking place at the Rodd Grand Hotel in Yarmouth, it will feature breweries from around Nova Scotia. There will be two tastings, in the afternoon at 2:30pm and in the evening at 7:30pm. The $30 package includes a commemorative glass and 5 sampling tickets, with additional sampling tickets available both online when you register and at the event itself. VIP and Designated Driver packages are also available: the VIP is priced at $45 and includes 10 sampling tickets, access to a VIP lounge and early access (30 minutes) to the tasting; the DD package gives 5 sampling tickets for food and non-alcoholic drinks and access to the VIP lounge and is priced at $15. Early bird registrants (until February 15th) save $5 on any package, while late registrations will see prices $5 higher. More information, including participating breweries will be available as the event gets closer. – Big Tide currently has an “extra-strong” batch of their Karnival Kölsch on tap at the brewpub; weighing in at 6.3% ABV (vs. its usual 4.5%), it also features Hallertau hops from Darlings Island Farm. – Boxing Rock Carbon-14 is back, Professor Jason MacDougall’s second-place winner from the first Boxing Rock Black Box challenge last year is available once again. It’s a big beer, a strong dark Belgian that should be perfect for a cold winter night. – Johnny Jacks Brewery in Oromocto has a new beer headed to local ANBL shelves soon, Pond Hockey Winter Ale. The 5.4% ABV, 33 IBU beer will be released in 750 ml bottles. – Hammond River S’mores Graham Cracker Imperial Stout is kegged and will be popping up at local tap accounts this weekend.